You’re in a class with one of your students when they share the news that they are thinking of going abroad soon to really put their English skills to the test. Then they ask you the question that you know was coming: Which test should I take to prove my English level? A slew of acronyms starts filling your head--TOEFL..or was it TEFL? IELTS? TOEIC? TOEIC-Bridge? FCE? CAE? PET? Then they ask even more questions: Does it matter which test I take? Is one cheaper? Is one less difficult? Which one is recognized more? How do I prepare? How soon can I take the test? If you’re not sure how to answer any or all of those questions, keep reading.Also be on the lookout for part 2 of the proficiency tests workshop next month that will go into more detail for teaching the strategies & skills required to pass the tests. The most important factors are the student’s current level and the amount of time they have to dedicate to preparing for the test. In order to be successful on any of the standardized English proficiency tests, a student needs to have a strong intermediate or upper intermediate level (B1-B2). If they have an advanced level, that’s even better. However, while the tests measure proficiency in English, they also measure a test taker’s ability to deal with various types of challenging, multi-step tasks in a fast-paced, timed environment. If a student’s level is below an intermediate level, it is highly recommended that they first study general English to increase their level before attempting any proficiency tests. A student could choose to take the TOEFL, IELTS, or TOEIC because they can’t fail it; they would simply receive an A1 or A2 level. However, most institutions requiring proficiency or employers looking at proficiency as a factor will not accept anything below a B1 level. The Cambridge Exams, on the other hand, test a specific level only. Therefore, if a student attempts the First Certificate Exam (FCE-B2 level), they can very well fail it if they get a score lower than 60%. Ask your student if they are willing (and financially able) to take this risk. Once it can be determined that a student has a proficient base level to work with, attention should be turned to how much time the student has to prepare and how much time they can dedicate to classes and studying. Generally speaking, a student with a strong intermediate level still needs at least 1-2 months of intensive studying and practice in order to feel confident going into the test and to achieve a good score. It may be possible in less time if a student is advanced, very familiar with the test’s format and tasks, and is highly motivated to study. However, it is best to allow for more time instead of cramming. Use this flowchart to help your student determine if they are ready to take a proficiency test. OVERVIEW OF TESTS: Which one should a student take? Deciding which test to take may be a very short process if the reason a student is taking the test is to be approved for a visa or entry into a university program. In these cases, a specific test and minimum score will be stipulated and you can start preparing. However, if there is no specific guideline given, start by asking if the student will use the proficiency test for purposes in Chile or abroad. If they have a particular region in mind, you can suggest a test that is more commonly recognized in that region. While there are plenty of exceptions, the general rule of thumb is that if a student wants to use the test in the US, they should take the TOEFL or TOEIC. If they plan to go to the UK, they should take IELTS or a Cambridge Exam. If a student is going to another country such as Canada, New Zealand, or Australia, you can check with immigrations to be sure, but generally IELTS will be more accepted. If a student decides that they will only use the exam for purposes in Chile, such as a new job or a work promotion, they will need to decide if they would like to demonstrate an academic or general proficiency. They should also consider whether or not they have a preference for a computer-based exam or a paper-based exam. Do they have basic computer skills? How is their handwriting? Are they comfortable speaking to someone in person or would they prefer to record themselves responding to prompts with a headset and microphone? Do they need the exam to be valid for a lifetime or is 2 years enough time? 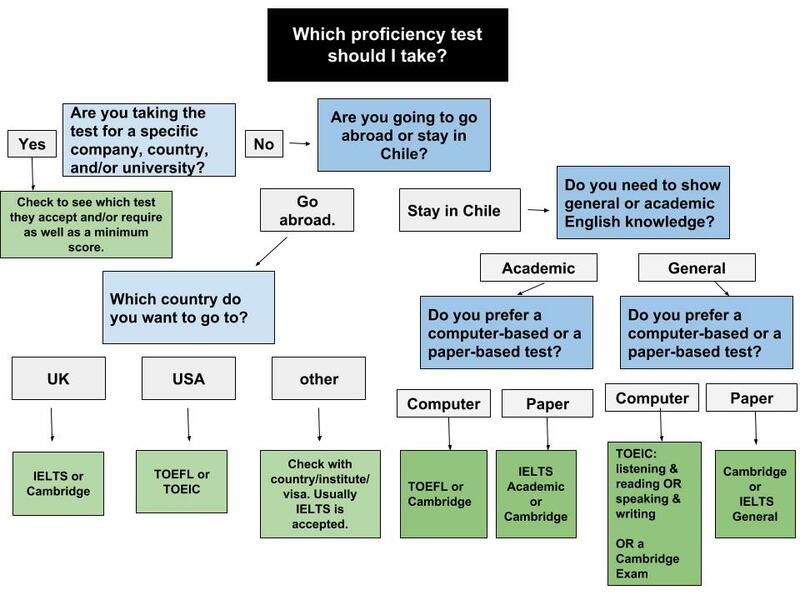 Use this flowchart to help your student determine which proficiency test to take.